OLX and hi5, both challengers to dominating juggernauts in their respective fields (online classifieds and social networking), have teamed up to expose each others’ admittedly vast but geographically spread audience to one another. OLX says it currently boasts 70 million unique visitors each month across 90 countries, largely thanks to existing partnerships with services that have historically seen most of their growth in Latin-America and Asia (Friendster, MySpace Lat-Am, Fotolog etc. ), while hi5 claims 60 million monthly unique visitors from 200 countries. Even with a reasonable amount of overlap accounted for, these are significant numbers, albeit in countries where potential advertising income is generally much lower than it is in the U.S. and Europe. 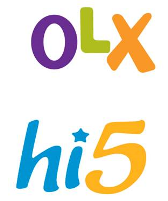 OLX (a competitor to Craigslist in the United States) and hi5 (a competitor to the likes of Facebook and MySpace on a global level) claim the fresh partnership serves to consolidate both companies’ hold on the Latin American market, while making way for accelerated growth in the rest of the world. As part of the agreement, hi5 will implement OLX features that include the ability to display ads on a user’s profile page and to see friends’ ads, as well as a feature to tell friends about their own ads via newsfeeds. OLX will also allow users to include videos and pictures in classified listings, comment, post/view listings in over 39 languages and 90 countries, and access the site from mobile devices. The latter two features are clearly meant to appeal to a large international user base. Oodle, another major player in the online classifieds space, has been scoring similar deals recently with social networking services and portals like Facebook, MySpace and AOL.